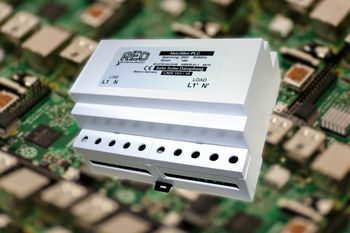 Power quality specialist REO UK has launched a new range of power line filters to combat electromagnetic interference (EMI) and Radio Frequency Interference (RFI) on power lines. The CNW 161 and 163 filters are designed for building controls, renewable and factory automation applications. They provide effective filtering in electrical power networks that use ripple control technology or data lines that use Power Line Communication (PLC), which are becoming increasingly common as more factories introduce industry 4.0 technologies. Two versions of REO’s power line filters are available, the standard CNW 161 PLC filter and the CNW 163 filter for applications requiring DIN rail mounting. Both models comply with the Electromagnetic Compatibility (EMC) Directive 89/336/EEC. Interference is generated by any electronic devices active on a power line, as well as by many switch-mode power supplies. The rise of Industry 4.0 has led not only a large number of electronic devices on lines, but also to a rise in the use of PLCs. This involves the transmission of data in electrical grids, often using existing lines to minimise costs. However, this further increases the likelihood of electrical interference. REO’s power line filters tackle EMI and RFI by removing high-frequency electrical noise from the supply network, with a filtering range from 50 kHz to 20 MHz. Most electronic noise falls within this range and will be safely removed before it reaches the powered devices. “The push towards industry 4.0 is putting a bigger strain on power lines and leading to many power quality issues,” explained Steve Hughes, managing director of REO UK. “The resulting electrical noise can reduce device lifespans and, in rare cases, permanently damage sensitive components. Therefore, it’s important for businesses to remove these frequencies and keep them safely under control before implementing industry 4.0 technologies. Power converters are necessary to use renewable energies in both industrial and residential environments. However, they generate a wide band of frequencies due to the high frequency switching involved in power conversion. In order to ensure reliable power quality, these frequencies need to be limited through filtering. To find out more about how you can improve power quality in your business, call us today on +44 (0) 1588 673411 today.